Paul Noble, installation view, in 'Welcome to Nobson', at Gagosian, Britannia Street, London. Image courtesy Gagosian gallery. 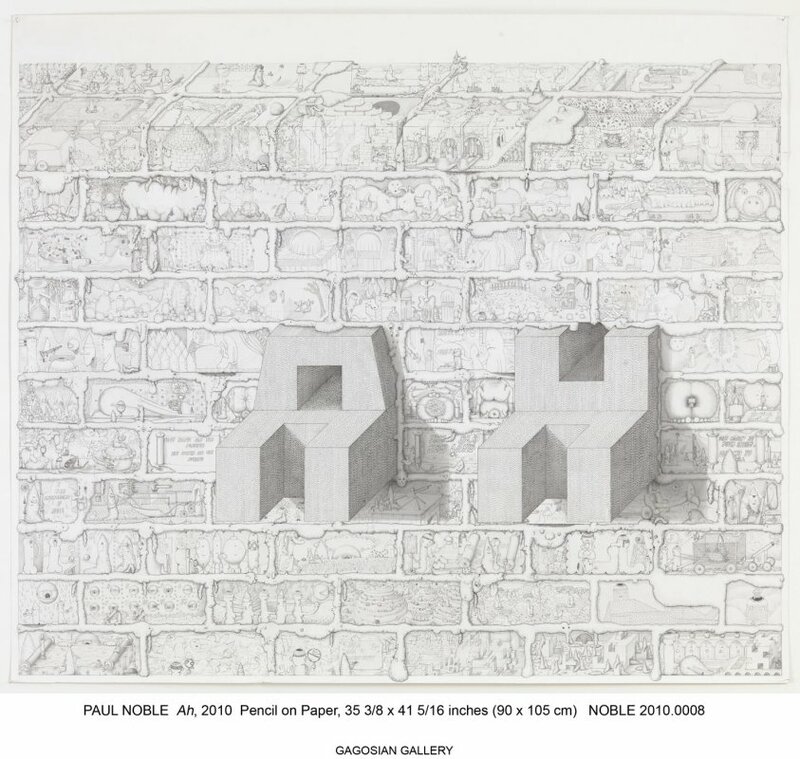 Large-scale drawings and sculptures from British artist Paul Noble are exhibited at Gagosian Gallery, 6 Britannia Street, London, WC1X 9JD (nearest tube/rail: Kings Cross). On until 17 December 2011. In Paul Noble’s latest exhibition, “Welcome to Nobson“, the images are often barren, devoid of life while the objects of living beings are ubiquitous. In other drawings, the landscapes are chock-full of objects but with no room for anything but these by-products of sentient activity. 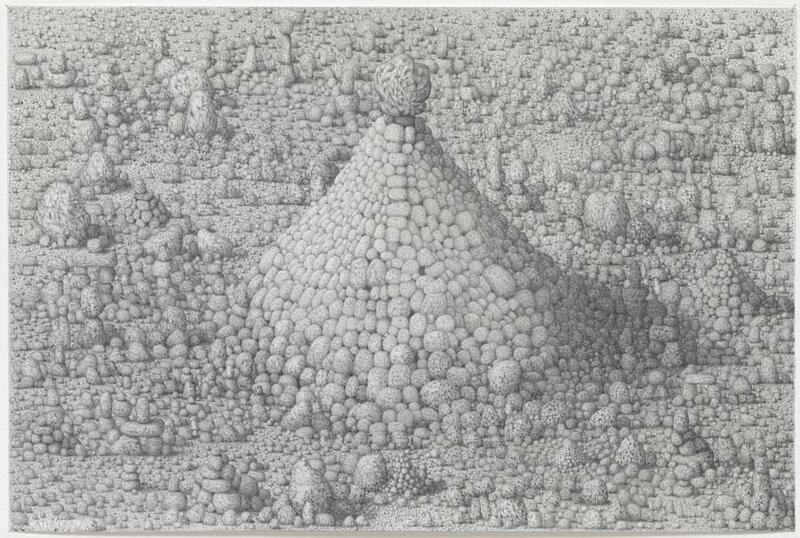 All of these enormous drawings are obsessively detailed and a little bizarre, landscapes and cities with very few figures appearing. The few recognisable beings are personified parts of homo sapiens anatomy, or even resembling the waste product of their biology. Perhaps Noble refers to MC Escher with his vaguely mathematical etchings, or even a nod to the surrealism of Salvador Dali, Hieronymus Bosch’s “Garden of Earthly Delights”. Henry Moore’s influence is noted in the two titanic blush-hued monuments that have a real presence in the room – these might be cotton candy, ice cream or… errm…the after-effect of eating too many pink sugary treats. I even thought of Jean-Paul Sartre’s novel “No Exit” which describes one’s personal hell as a white room with no doors or windows. Noble’s drawings give me that feeling of stark aloneness in a world surrounded by so many things that don’t make much sense after too long looking at them. …a meditation on city planning, modernism, and life at the turn of the twenty-first century. Paul Noble, installation view, in ‘Welcome to Nobson’, at Gagosian, Britannia Street, London. Image courtesy Gagosian gallery. Paul Noble: “Welcome to Nobson” is a recommended exhibition if you are interested in drawing as art practice (particularly on a large scale), sculpture, and the surreal. Paul Noble, installation view (entrance), 2011, wooden beads and paint, in ‘Welcome to Nobson’, at Gagosian, Britannia Street, London. Image courtesy Gagosian gallery. Exhibition details: “Welcome to Nobson” at Gagosian Gallery, Britannia Street, London is on from 10 November through 17 December 2011. Free entrance, step-free access.